» ResortQuest Hawaii has appointed John Young general manager of Kona by the Sea. 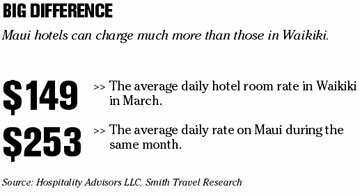 He previously worked for Starwood Hotels & Resorts, the Maui Visitors Bureau and Village Resorts. He has 20 years of experience in the travel industry. » American Savings Bank's Financial Services Group has hired John Woodruff as a financial consultant. He will be responsible for assisting customers with investments, insurance, estate planning and college savings. He has nearly 40 years of experience in finance and banking. » Bright Light Marketing Group has hired Wally Zimmerman as client services vice president. He will be responsible for client services, creating a strategic growth plan for the agency and developing the new media practices. He has more than 35 years of experience in the communications field and was news director for KITV from 1989 to 2002. » Hong Kong Harbor View Seafood Restaurant has appointed Andrew Lee manager. He previously served as an assistant manager at Pietro's Italian Restaurant. 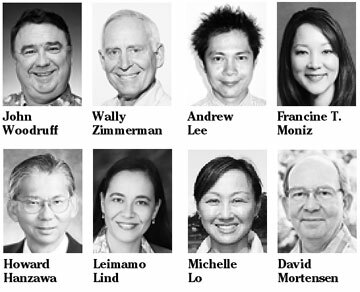 » Central Pacific Bank has announced the following assistant vice president and branch manager promotions and new hires: Rachel L. Ching has been hired as assistant vice president and Moiliili branch manager; Francine T. Moniz has been promoted to assistant vice president and McCully branch manager; Isaac Pena-Parrilla has been hired as the Kihei branch manager; Bonnie J. Pond has been promoted to assistant vice president and Kailua-Kona branch manager; and Sharon N. Sato has been promoted to assistant vice president and Pearlridge branch manager. » Island Air has hired Wesley Thomas Leong as controller. He will be responsible for managing the company's accounting practices. He has nearly 20 years of accounting experience. » Kaanapali Development Corp. has appointed Howard Hanzawa vice president. He will be responsible for overseeing the company's operations and projects. He has over 35 years of experience in civil and structural engineering and construction. » The Maui Hotel & Lodging Association has appointed Leimamo Lind executive director. She previously as Aloha Airlines' Maui station director. » Kaanapali Golf Courses has appointed Michelle Lo assistant golf professional. She will work in the golf shop, help with customer service and spearhead the courses' junior golf program. She previously worked in Hong Kong and Los Angeles. » The University of Hawaii Foundation has hired David Mortensen as foundation and corporate relations director. He will be responsible for working with companies and foundations to form partnerships and raise funds to support the system campuses and colleges. He previously served as a development director at the University of Utah. TOKYO » Profit-rich Honda Motor Co. announced sweeping expansions plans today to spend $1.18 billion to build new plants in the United States, Canada and Japan, to boost production amid meet soaring demand for its vehicles. The three plants -- auto factories in Japan and the United States and an engine plant in Canada -- are aimed at meeting an ambitious 34 percent increase in annual sales to 4.5 million vehicles a year by 2010, Honda President and Chief Executive Takeo Fukui said. Tokyo-based Honda is tapping record profits to boost output, particularly in North America, a region that accounts for about half the company's annual global sales. The upgrade contrasts sharply with the fortunes of domestic giants General Motors Corp. and Ford Motor Co., which are battling weak sales and a trail of red ink. MINNEAPOLIS >> Northwest Airlines Corp. is warning flight attendants that they won't get a better deal if they reject the wage-cutting pact they're voting on now. Flight attendants are voting through June 6 on whether to accept a tentative agreement that would cut their pay 21 percent and require them to work longer hours. It would save Northwest $195 million a year. Baggage handlers and ramp workers rejected their own pay-cut offer from Northwest, forcing the Eagan-based airline back to the bargaining table. And flight attendants will vote later this summer on whether to switch unions. Those two events may have some flight attendants hoping they can get a better deal. The airline said that won't happen. Record labels owned by Sony BMG and EMI Group Plc asked a judge to block XM Satellite Radio Inc., the biggest U.S. provider of pay-radio service, from starting a product that allows subscribers to download music. The suit by 10 record labels, filed yesterday in federal court in New York, accuses XM of copyright infringement and also seeks undetermined monetary damages. XM's product, called the "Inno," according to the Recording Industry Association of America, allows users to download permanent libraries of 50 hours or about 1,000 songs sorted by artist, title and genre. The service blocks the distribution of music through "lawful, legitimate" services such as Apple Computer Inc.'s iTunes, according to the lawsuit. SAN FRANCISCO » Hewlett-Packard Co.'s fiscal second-quarter profit rose 51 percent as the printer and computer company won PC market share from its biggest rival while benefiting from higher revenue and lower costs. The results released yesterday contrasted with the gloomy forecast Dell Inc., the world's biggest PC maker, delivered last week. The higher-than-expected profit comes 14 months after Mark Hurd joined the company as chief executive under a mandate to cut costs and boost stagnant revenues. For the three months ended April 30, HP earned $1.46 billion, or 51 cents a share, compared with $966 million, or 33 cents per share, in the same quarter last year. Sales rose 5 percent to $22.6 billion from $21.6 billion last year.